20 people killed in apparent chemical weapons attack in Idlib province in Syria. At least 20 people were killed in a suspected chemical weapons attack in Syria late Sunday night, Arab news outlets reported Monday. Syrian human rights organizations told The Associated Press just before midnight Sunday that the rebel-held town of Saraqeb (Saraqib) in Syria’s Idlib province near the border with Turkey was subjected to a chemical weapons attack. Arab media outlets reported early Monday morning that a number of victims in the attack had succumbed to their injuries At least 20 people, including women and children, have reportedly died after being exposed to chlorine gas during the attack on Saraqeb. American Defense Secretary Jim Mattis warned Syria just days before the apparent attack against using chemical weapons. "You have all seen how we reacted to that, so they'd be ill advised to go back to violating the chemical convention,” said Mattis, referring to the April 2017 US missile strike on a Syrian airbase following a chemical attack blamed on the Syrian regime in Khan Sheikhun. A Russian warplane was shot down over the Idlib province over the weekend, with the Hayat Tahrir al-Sham Islamist rebel group claiming responsibility. "We were able to bring down the Russian warplane with a shoulder-fired missile above Saraqib in Idlib this afternoon," said Mahmoud al-Turkmani. 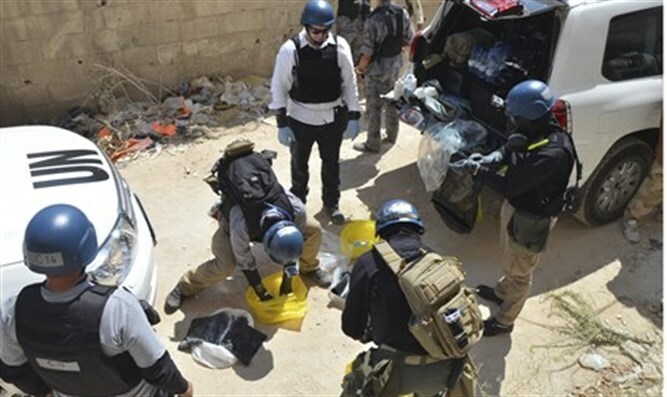 The Syrian Civil Defense search-and-rescue group said on Sunday that three of its rescuers and six others were injured by chlorine gas in Saraqeb, a rebel-held town less than 16 kilometers (10 miles) from the front line with government forces. Reports of the latest chemical weapons attack comes days after the Trump dministration accused Syrian President Bashar Al-Assad's government of producing and using "new kinds of weapons" to deliver deadly chemicals, despite committing to abolish its chemical weapons program in 2013.